Adventures in the Endless Pursuit of Entertainment: Happy Angie Day! Happy Fourth Annual Angie Day! Where has the time gone? 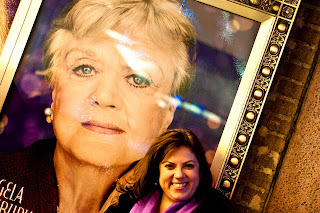 Five years ago, I was so certain that I would never see Angela Lansbury perform in a full Broadway production, I flew out to LA to see her in a reading (worth it). Now, we not only celebrate her for being back on Broadway but in three full productions - Deuce, Blithe Spirit and best of all, the Sondheim musical A Little Night Music. She added a Tony for Best Supporting Actress in a Play to her collection of four Tony's for Leading Actress in a Musical and come June 13th, she might just win a record sixth Tony award! To celebrate the day, I'm having a spot of tea, pre-ordering Murder, She Wrote: The Complete Eleventh Season (due out this Tuesday, Feb 2nd! ), reading the Spring 2010 issue of The Sondheim Review, upon which Angela graces the cover, and anticipating all of the upcoming events I'm attending at which Angela is either being honored or is performing. I love that picture of you standing in front of Angela's poster! The colors are so vibrant. It looks like a splash of sunset! You're so fortunate to be able to see her so often!